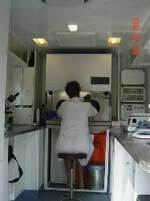 ORLANDO Telecom SRL is a division of ORLANDO Systems Inc , NY, specializing in the manufacturing of "Mobile Medical, Biological, Clinical and Analytical Laboratories" (like this Mercedes based unit on the top) for Rapid Interventions in Emergency Epidemiological situations in infected zones. ORLANDO offers equipment, design and installation from its Office and Factory locations in Bucharest since 1995. OSI also markets hi-tech products, services and equipment for Radiation detection and evaluation, security systems and telecommunications. The Mobile Biological Labs project was developed and manufactured by Orlando Systems Inc/Orlando Telecom Srl is being readied in Bucharest , in collaboration with Romanian companies, Military and Health Organizations, incorporating US, EU and local technologies. The primary mission of our Bio-Safety LEVEL II Labs entails GATHERING AND CONSERVATION OF SAMPLES, monitoring and verification, diagnosis/Rapid Testing, for severe epidemics or BIOTERROR alarms, oriented towards the presented dangers (SARS, ANTHRAX, Variola, Botullin, Cholera, TBC, Malaria, Legionaries, Hepatitis, etc). Optionally other NBC equipment can be incorporated. Here is our Factory in Bucharest . The Labs are profiled as Peripheral-Intermediary, as per WHO standards, for Intervention in Infected Epidemical areas for SARS, AIDS, Ebola, Small Pox and are therefore being offered for medical care in Africa/Asia. Very difficult medical situations like Afghanistan or Iraq are typical as well as the Asian Tsunami affected areas. EU Road testing has been completed, RAR homologated as Trailer and Truck based integrated units. The basic mission proposed for this containerized Mobile Lab is to be transported or self - transported in a very short time anywhere there is a Epidemic Emergency , BIOTERROR alarm or a Bio danger has to be verified (just like the SARS situation) including sea or airborne applications. It can be located close to the source of the infection and works as a RULE+REFFER instrument, without additional risk of further propagation via unnecessary (according to the latest CDC Atlanta strategies). The main purpose of the project, besides local use, is to start world export with the production and integration of 100's of these Labs and Medical Clinics done in Romania , Hungary , Italy and other countries. The Labs are built in custom cut-away containerized trailers and can be integrated with Transit/Mercedes Sprinter type chassis vehicles and self-supporting 4 wheel platforms. We also expect integration with boats and potoons for water transport use. 1. The technology used in the ORLANDO Mobile Medical Labs MLS3000, MLEE-3500, MLBSL2-3500 (with 2,000 - 3,000 kg gross weight and 3 - 3.5meters long) is modular, user oriented, and easy to use. These models, ready for Bio Threat-A, are equipped with Level 2 protection, via its Bio-Safety Level II Laminar Flow unit and other special features like an optional sample entry compartment, and used for collecting, Rapid Test, Rule+Refer as per CDC-Atlanta and WHO recommended rules. The labs also include an externally attached 2x3x3meter weatherproof tent, for decontamination and sample collection, with easy access to power, decontamination equipment and optionally a number of protection uniforms, masks, oxygen, and vaccines. The MLEE, the MLBSL-3500 and others are upgraded to Biosafety Levels 2 and more. 2. The Lab container can be easily pressurized with fresh air if needed, at a Low Negative or Positive level by its fully integrated double Bio HEPA filtration system (in and out air flow). The standards are WHO/EU/ETSI/EC, USA/FCC/FDA, and NATO optional. The project will have a Civil WHO level homologation for Health Sanitation, Civil and Military Defense. The Lab container respects the WHO recommendations for Peripheral Labs and has 1 or 2 medical refrigerators/freezers plus its own Autoclave unit. Equipped with a performant A/C system, it has a programmable internal power grid of 220VAC & 12VC, a Power Generator with over 15 hours of independence, several hours of back-up from batteries and a 220V inverter/converter with a set of Marine Solar Cells included. 3. The Mobile Lab (as mounted on a 4 wheel trailer platform with air suspension and mounted on a Mercedes Sprinter Turbo Diesel DOKA 411) has passed the RAR organization road test, according to the European norms for 2,000kg and 4,500kg and is legally licensed in Romania . 4. The Mobile Support integration or transport unit will be supplied and modified locally in end-user country whenever possible (land/water). We have analyzed the locally made ARO units, Mercedes, FIAT, Ford and some other 4 wheel-drive vehicles of similar weight and as possible candidates for this job. 5. The Optional VHF/Tetra/GSM, Inmarsat, Intelsat or 3,5GHz communication modules, etc, can be integrated in the system (custom design) for voice/data on the internally provided platform, with 220VCA or 12 VDC supply and antenna outlets. 7. We are presently preparing plans for other Mobile Laboratory platforms, tropicalised, applicable for Vaccination, Veterinarian campaigns, Nuclear accidents, for Airborne & Seaborne needs. Also supplied in co-operation with other partners are planned units for clinical, high level telecommunication, goniometry, aircraft, EPA-pollution, based on modular systems, with 2-3 integrated remotes. 8. The ORLANDO manufactured Mobile Medical Laboratories will be optionally equipped with a modern digital station for Meteorology and Pollution detection: radioactivity, chemical and industrial gases (Gammalert) for accidents or radioactive material attacks. Meteo and Pollution Monitoring Station support is built-in, with pre-wiring in place.